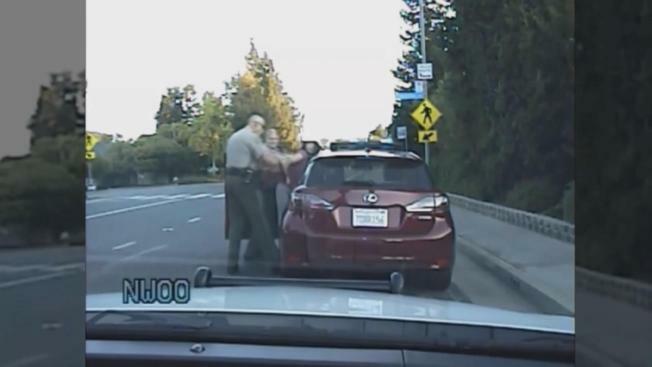 Santa Clara County is in the midst of a heated legal battle involving two former sheriff's deputies accused of roughing up and injuring a woman during a traffic stop and arrest in 2014. The arrest was captured on the deputy's dashboard camera. It shows the woman driver being slammed against her car and handcuffed. Both former deputies, Dan Forest and Rachel Strickland, are named in the lawsuit along with the county. The dash-cam footage shows Forest's car rolling past a car driven by Shiow-Huey Chang as he asks aloud why the woman was stopped. Forest then pulls over Chang and approaches the car. Later in the video, with Strickland now on the scene, Chang is seen and heard arguing with Forest. And when her hand makes contact with his flashlight and possibly his hand, the encounter turns physical. "Why are you doing this?" Chang can be heard saying. Legal analyst Steven Clark examined the video. "Certainly, when you saw what the officer did at the end of the tape, and you start with the way the citizen contact was initiated, you have a recipe for disaster," Clark said. Forest and Strickland resigned sometime after the incident. The Santa Clara County Sheriff's Office refused to comment about the case or the resignations. The lawsuit alleges that the former deputies abused Chang under the color of authority and accuses the county of improper training. "It's a very sensitive time," Clark said. "It's also important that when you see these videos that we don't make the same mistakes twice. That we look at these videos as teaching moments." Chang also would not comment on the case. NBC Bay Area has learned that Chang may have faced a resisting arrest charge after the incident. But sources said the District Attorney did not pursue charges.